Tonight, Monster Energy NASCAR Cup Series qualifying takes to the track at Homestead-Miami Speedway. 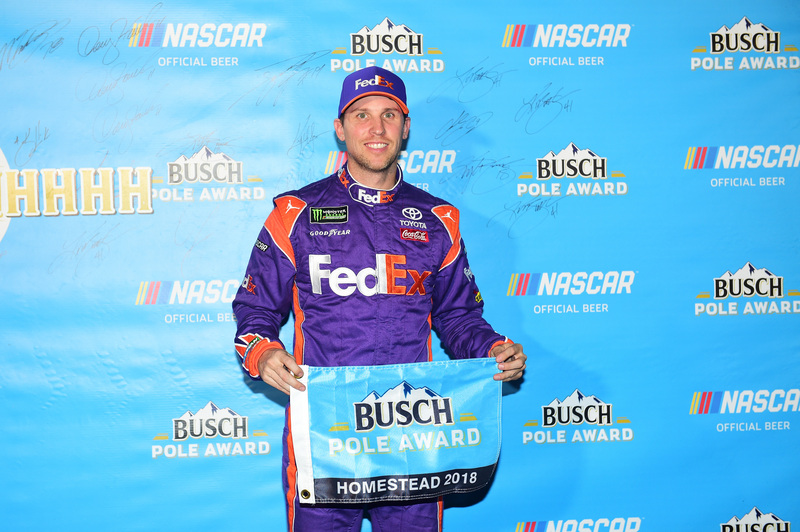 This will set the starting lineup for Sunday’s Ford EcoBoost 400 in Homestead, Florida. View the full 2018 Homestead starting lineup for the NASCAR championship race below. 5 minutes into round one, three of the four playoff drivers have now turned a lap. Joey Logano sits at the top of the board. Logano struggled in the opening round of practice this afternoon. However, the crew went to work and he turned his fastest practice lap during his third run, on old tires. “It finally got through the corner for the first time today,” Logano said after his round one qualifying run. 8 minutes in, Kyle Busch heads to the track. To the top of the board he goes. Busch was the only championship driver to use two sets of tires in the opening round of practice. 5 minutes remain, all the championship contenders sit at the top. Busch, Logano and Truex sit one, two, three. Kevin Harvick took it easy on his lap. He’s 15th on the board. Kyle Busch wins round one of Homestead qualifying. 5 minutes remaining, three of the four championship drivers has set a time. Truex sits P1, Logano is P2 and Harvick is P7. Truex was fighting the wheel on his lap. 4 minutes remaining, Erik Jones takes the top spot. Kyle Busch has to lift off turn two. Busch still put it in P3. Has Harvick been taking it easy on his tires in the first two rounds? We’re about to find out. He’s the second car on the race track. Kurt Busch sits at the top of the board. Harvick’s car was too tight. He ran the bottom in turn one, the middle in turn two. Harvick will return for another run. Brad Keselowski heads to the top of the race track. Larson did that at the end of round two. It worked for both. Keselowski just went to the top of the board. Kyle Busch runs the bottom lane. He jumps to the top of the board. Truex is 2nd. Harvick is on track for his final run. Hamlin is on his first run int he round. Denny Hamlin takes the pole at Homestead-Miami Speedway! View the full 2018 Homestead-Miami Speedway starting grid below. The’ll drop the green on Ford EcoBoost 400 on Sunday in Homestead, Florida.